Hot Wash Portable Toilet These self-contained units are ideal for sites of any size. Ideal for 24 hour construction sites. Hot water flush keeps the portable toilet cleaner for longer. Fully compliant with HSE recommendations (Download the Summary PDF 73.6 kb opens in new tab). The units can be placed almost anywhere to suit your requirements and are a fitting solution to welfare requirements and runs off 240v electricity (Hot water created by water heater). 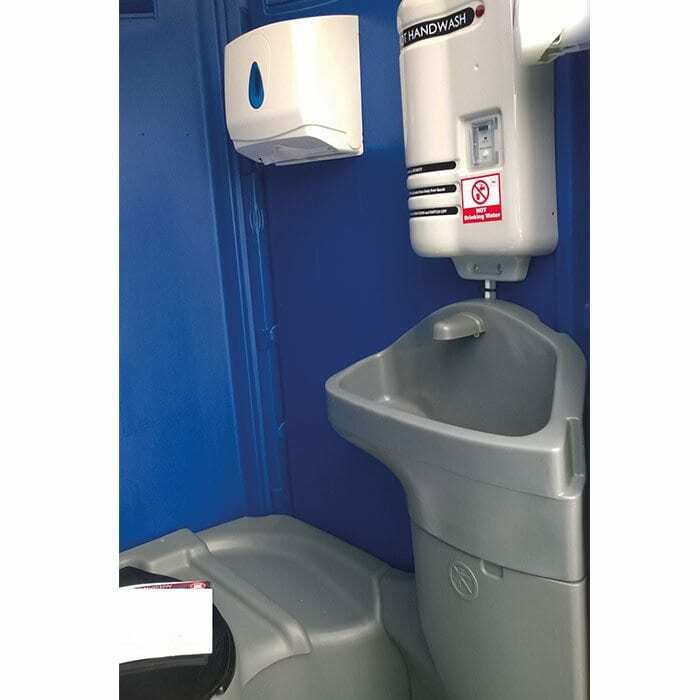 This Hot Wash Portable Toilet includes Convenient corner shelf provides a clean surface for tools and personal items. These units offer the same benefits as the cold-hand wash system, the difference being the water temperature. These are an ideal solution for temporary use and require a 240 volt and 16 amp power supply. These units are adequate for situations where a hot hand-wash system is more appropriate, such as office refurbishments where temporary units are required. Each hot hand-wash toilet unit is rigorously steam-cleaned, fully sanitised, with outflow water drained and replaced before delivery. Our hot hand-wash toilets for construction and events are nationwide and can usually be delivered within 24 hours. The size of the vehicle we will deliver the units in will depend on the type and quantity of units. Please be aware of access for the vehicle when ordering toilets. Our team of dedicated specialists can arrange any amount of toilets from our vast range of suppliers. Whether it is a couple of units for a small event or a fleet of hundreds for large-scale events, we have the solution for you.